In 2003, the American public wasn’t quite ready to recognize the idea that George W. Bush was a monster who had thrown the country—and partly the world—into an endless and meaningless war in Iraq, which Michael Moore discovered when he used his acceptance speech for Bowling For Columbine’s Best Documentary Academy Award to speak out against Bush and his habit of promoting fiction as fact. 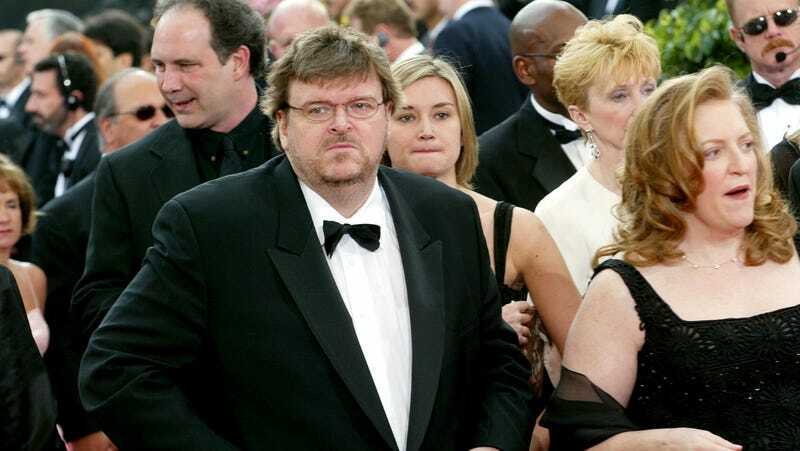 Moore was essentially booed off of the stage by the audience at the Oscars, with the celebrities in attendance evidently unprepared for Moore’s now-famous “tell it like it is!” shtick. I’ve invited my fellow documentary nominees on the stage with us, and they are here because they are in solidarity with me because we like nonfiction. We like nonfiction, but we live in fictitious times. We live in the time where we have fictitious election results that elects a fictitious President. That’s when all hell started. Now, the cacophony of booing is getting quite loud and I can’t even hear myself. Whether it’s the fiction of duct tape or the fiction of orange alerts, we are against this war, Mr. Bush. Now I’m just trying to be heard, this wasn’t even in the original speech, and I’m just telling people, in front of a billion people, shame on you, but keeping it clean, Bob. Now the microphone is lowering into the stage, they’ve struck up a band, the stage manager is giving me the heave-ho and I’m bending down to the microphone. And any time you’ve got the Pope and the Dixie Chicks against you, your time is up. That was the end of me, and they hauled me off the stage. So now, here for the first time ever, is the rest of my Oscar acceptance speech. It’s ironic that that part of the speech Moore was unable to give is the part that’s less overly political than the opening, with him talking about himself and his filmmaking journey more than the injustices perpetrated by the Bush administration. It’s possible he could’ve given more of his speech if he had started with that stuff, but either way, Moore told the 2018 audience that his message is still worth hearing. “Tonight, we are not only still at war, but we have a president who has declared war on our democracy and war on us,” he added.